Charlotte Bronte. Bronte, Charlotte, photograph of an illustration. International Portrait Gallery. Charlotte Bronte was one of three famous sisters (Anne and Emily Bronte being the other two) who each contributed significantly to the literary landscape of the nineteenth century. Charlotte Brontee's reputation rests mostly on her 1847 novel Jane Eyre, a book that was a public sensation in its own day and has scarcely diminished in popularity since. The book’s enduring attraction to critics and readers alike has much to do with the ways its headstrong narrator, the heroine Jane Eyre, both satisfies and challenges the social and literary conventions of the Victorian era. In one sense, the book is a period piece about the narrow spheres of British governesses; in another sense, it foreshadows a brand of feminism that would not take shape for another one hundred years. Tragedy for the Bronte Sisters at Cowan Bridge School. In 1824, when she was eight years old, Charlotte and her sister Emily joined their older sisters at the newly opened Clergy Daughters’ School at Cowan Bridge in the parish of Tunstall. Living conditions at the school were harsh and difficult. Charlotte’s later depiction of the bleak ‘‘Lowood School’’ in Jane Eyre was based on Cowan Bridge. Charlotte found the rigors of boarding school life trying in the extreme. Food was badly prepared under unsanitary conditions and, as a consequence, outbreaks of typhus forced the withdrawal of many students, some of whom died. Maria developed tuberculosis while at Cowan Bridge and was harshly treated during her incapacitating illness, an incident Charlotte drew upon in portraying her character Helen Burns’s martyrdom at the hands of Miss Scatcherd in Jane Eyre. Patrick Brontee was not informed of his eldest daughter’s condition until February 1825, two months after Maria began to show symptoms; when he saw her, he immediately withdrew her from the school and she died at home in early May. Elizabeth, in the meantime, had also fallen ill. When the entire school was temporarily removed on doctor’s orders to a healthier site by the sea, Elizabeth was escorted back to Haworth where she died two weeks after Charlotte and Emily were brought home by their father on June 1. Isolation in Yorkshire a Spur to the Imagination. Following the tragic experience at Cowan Bridge, Patrick Bronte tutored his four remaining children at home and provided them with music and art instruction from competent teachers. The relative isolation of the Bronte children in their Yorkshire home caused them to develop very strong attachments to each other. The weather in Yorkshire was often inhospitable, and the children, with no other playmates to divert them, relied on their imaginations to invent their own make-believe world called Gondal, about which they created many poems and stories. In 1829, Charlotte began writing poetry. Producing sixty-five poems and a satirical play about poetry writing in 1829-1830, the fourteen-year-old self-consciously attempted to define herself as a poet. The various poetic forms that Brontee experimented with during this time reflect her self-designed apprenticeship through imitation of earlier poets. For example, her many descriptions of natural landscapes are indebted to the eighteenth-century topographical poetry that had been developed by ‘‘nature poets’’ such as James Thomson and William Wordsworth. Attempts at Poetry Interrupted by Schooling at Roe Head. This spate of poetic production was interrupted in January 1831, when Bronte left Haworth for a second time, traveling twenty miles to become a student at Roe Head School in Mirfield, near Dewsbury. Roe Head was a small school that usually enrolled only about seven boarding students at a time, all girls around the same age, and therefore was able to attend closely to the needs and abilities of individuals. Though she was homesick at first, in time she won the respect and affection of her peers and came to feel quite at home in her new school environment. After her departure from Roe Head in May 1832, the rather uneventful round of life at Haworth, where she was in charge of her younger sisters’ education, eventually led Bronte back to writing poetry. In December of 1836, she decided to try her hand at professional writing, with the hope of earning her living as a publishing poet. To this end she sought the advice of no less a figure than Robert Southey, then poet laureate of England, to whom she sent a selection of her poems. The discouraging response in his letter of March 12, 1837, has become infamous: “Literature cannot be the business of a woman’s life: & it ought not to be. The more she is engaged in her proper duties, the less leisure she will have for it, even as an accomplishment & a recreation. To those duties you have not yet been called, & when you are you will be less eager for celebrity.’’ Such was the prevailing opinion at the time about women’s artistic abilities and women’s proper place in society. It was widely believed that a woman’s only ‘‘proper duties’’ were to be a wife and mother. An unmarried woman might find respectable work as a teacher or governess, but a woman seeking a professional career of any sort was seen as unnatural. Despite Southey’s discouragement, between January 1837 and July 1838 Bronte wrote more than sixty poems and verse fragments, including drafts of what were eventually to be some of her best poetical works. However, they remained fragmentary and defective; it was not until 1845 that she was able to revise them into poems she was willing to publish. Broadened Horizons at a Belgian School. Charlotte and Emily Bronte left England in February 1842 to enroll as the oldest students in a Belgian school run by Madame Claire Zoe Heger and her husband, Constantin. English and Protestant in a school of Roman Catholic Belgians, the Brontees were isolated from their younger peers by differences in language, culture, age, and faith, not to mention Emily’s austere reserve and Charlotte’s social timidity. However, both young women made considerable academic progress in Brussels and were praised for their success. Although she apparently composed little new poetry in Brussels, Brontee did continue to transcribe revised versions of earlier poems into a copybook she had brought with her from Haworth, an indication that she may have been contemplating publishing them in the future. The letters she wrote to Constantin Heger from Haworth in 1844 reveal Bronte’s increasing anxiety about establishing herself in a fulfilling line of work. Always troubled by extreme nearsightedness, she experienced a temporary further weakening of her sight at this time, causing her to sink into depression. Self-Published Poems with Pen Names. Bronte suddenly recovered from this period of depression in the fall of 1845, when she stumbled upon a notebook of Emily’s poems. She eagerly pressed her sister to publish her poems with a selection of her own verse, to which were added poems contributed by Anne. The sisters agreed to publish the poems under male pen names, probably in order to overcome the widespread prejudice against literature by women and the potential embarrassment their pursuit of a writing career might cause their family. Indeed, it was common practice for women writers (including such nineteenth-century favorites as Jane Austen, George Eliot, and George Sand) to publish either anonymously or under a male pen name. Charlotte Brontee energetically set about the task of finding a publisher for Poems by Currer, Ellis, and Acton Bell (1846), which the small London firm of Aylott & Jones agreed to print at the authors’ expense, a common practice for unknown writers. Despite Charlotte Bronte’s excitement over her sisters’ verse, she wrote almost no poetry after 1845 and was already attempting to secure a contract for her first novel, The Professor (1857), before the Poems had even appeared in print. The Professor was rejected nine times before she received an encouraging reply from the firm of Smith, Elder, which declined to publish the book but asked to review any other novel she might be working on. Heartened by this request, Bronte finished Jane Eyre rapidly— in about two weeks—and had the satisfaction of seeing the novel in print shortly thereafter. The book was immediately popular and ‘‘Currer Bell’’ quickly became known by the reading public. After Jane Eyre, Marriage and Celebrity. After the success of her novel, Bronte wrote no poetry except for three unfinished poems on the occasions of her sisters’ deaths. Though greatly saddened by the deaths of her siblings, she continued to publish novels—Shirley in 1849, and Villette in 1853. Letting her identity become known, she achieved the literary celebrity that Southey had warned her to avoid and became acquainted with several important authors, including William Makepeace Thackeray. At the age of thirty-eight, Bronte married her father’s curate, Arthur Bell Nichols, and died, possibly of either dehydration and malnutrition brought on by severe morning sickness (it was speculated that she was pregnant) or a serious infection of the digestive tract, on March 31, 1855. She is buried, along with the rest of her remarkable family (except for Anne, who died in the seaside town of Scarborough), in the Church of St. Michael and All Angels, immediately across from her parsonage home. Susan B. Anthony (1820-1906): An American civil rights leader who played a prominent role in the abolitionist, temperance, and women's suffrage movements. Elizabeth Barrett Browning (1806-1861): One of the most respected Victorian poets, she is best known for her Sonnets from the Portuguese (1850). Alfred Lord Tennyson (1809-1892): English poet laureate who relied heavily on natural imagery, revealing traces of Romanticism. William Makepeace Thackeray (1811-1863): English novelist and journalist who wrote one of the first glowing reviews of Jane Eyre. Louisa May Alcott (1832-1888): Alcott gained lasting fame for her 1868 novel Little Women. The Rise of the Novel. 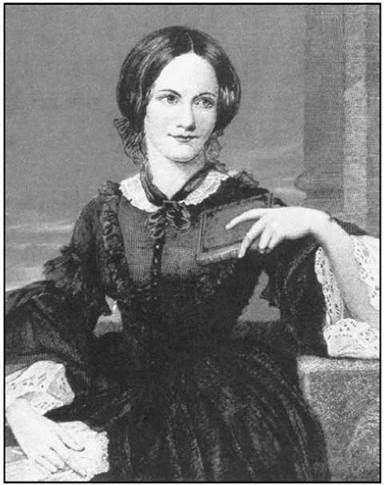 Although Charlotte Bronte started her career as a poet, it is as a novelist that she is best remembered. Like her contemporary Elizabeth Barrett Browning, she experimented with the poetic forms that became the characteristic modes of the Victorian period—the long narrative poem and the dramatic monologue. Unlike Browning, Brontee gave up writing poetry at the beginning of her professional career, when she became identified in the public mind as the author of the popular novel Jane Eyre (1847). Bronte’s decision to abandon poetry for novel writing illustrates the dramatic shift in literary tastes and the marketability of literary genres—from poetry to prose—that occurred in the 1830s and 1840s. Bronte’s remarkable success with Jane Eyre was in part attributable to the shift in literary tastes of the period. While the English literary landscape of the seventeenth and eighteenth centuries had been dominated by poets, the nineteenth century reading public demanded works with which they could more readily identify. Jane Eyre was such a work: a story of an ordinary person who experiences extraordinary things. However, if one agrees with Virginia Woolf’s claim that Charlotte Bronte’s novels are read ‘‘for her poetry,’’ one might argue that Bronte never did entirely abandon her career as a poet. Adapting her creative impulses to the demands of the market, Brontee incorporated poetic features into the more viable form of the novel, and so became a successful literary professional in Victorian England. Gothic Influence in a Bildungsroman Format. Like her sister’s novel Wuthering Heights, Jane Eyre is heavily influenced by the Gothic horror novels that rose to popularity at the turn of the nineteenth century. The dark setting, the mysterious Mr. Rochester, and the strange goings-on in the attic of his home all play on the conventions of horror. At the same time, the novel follows the structure of a Bildungsroman, or novel of maturation, as the plot follows Jane’s journey from youth into womanhood. In Jane Eyre, the title character is saved thanks to love—she eventually leaves a life of drudgery and finds herself happily married to her previous employer, Edward Rochester. Though this kind of romance is difficult to find in the real world, its presence in literature has been a constant through the ages. Here are some other works where love and romance save the day. Cinderella (1697), a fairy tale by Charles Perrault. Though there are many versions of the Cinderella fable, Perrault's was the first to introduce the glass slipper and the fairy godmother's pumpkin; thanks to these props, a forlorn chambermaid wins the hand of a handsome prince. A Room with a View (1908), a novel by E. M. Forster. In this Edwardian novel, a young Englishwoman traveling in Italy falls in love with a man who seems ''beneath her.'' She ignores the advice of her chaperon and happily elopes anyway. The Sound of Music (1965), a film directed by Robert Wise. Via her musical abilities and endless cheer, a governess manages to win the hearts of the captain for whom she works and his children in this hit movie based on a musical. Although most critics have praised Bronte’s narrative technique, some have argued that the story of Jane Eyre is unrealistic. Many commentators have lauded the novel’s powerful language and have explored the work’s unity, which they attribute to the use of the heroine as narrator as well as to Jane’s process of spiritual growth. 1. Some readers of Jane Eyre wonder about the first Mrs. Rochester and her somewhat cruel treatment by Mr. Rochester. Jean Rhys’s Wide Sargasso Sea (1966) is a ‘‘prequel’’ to Jane Eyre that imagines the early life of Edward Rochester’s first wife. 2. Read a poem of Emily Bronte’s and one of Charlotte’s. Do you, like most critics, find Emily’s poetics to be stronger? Why or why not? 3. Look at Edward Rochester and then at Heathcliff from Emily Bronte’s Wuthering Heights. Do the two men have any traits in common? Would men like Mr. Rochester and Heathcliff be popular in today’s world? Allott, Miriam, editor. The Brontes: The Critical Heritage. London: Routledge & Kegan Paul, 1974. Bayne, Peter. Two Great Englishwomen: Mrs. Browning and Charlotte Bronte. London: Clarke, 1881. Crump, R.W. Charlotte and Emily Bronte, 1846-1915: A Reference Guide. Boston: G. K. Hall, 1982. Gaskell, Elizabeth Cleghorn. The Life of Charlotte Bronte, 2 volumes, third edition, revised. London: Smith, Elder, 1857. Gilbert, Sandra M., and Susan Gubar. The Madwoman in the Attic: The Woman Writer and the Nineteenth Century Literary Imagination. New Haven, Conn.: Yale University Press, 1979. Nestor, Pauline. Female Friendships and Communities: Charlotte Bronte, George Eliot, Elizabeth Gaskell. Oxford: Oxford University Press, 1985. Tillotson, Kathleen. Novels of the Eighteen-Forties. Oxford: Clarendon Press, 1954, pp. 257-313. Wise, Thomas J., and John A. Symington, editors. The Brontes: Their Lives, Friendships and Correspondence, 4 volumes. Oxford: Blackwell, 1932. Woolf, Virginia. ‘‘’Jane Eyre’ and ’Wuthering Heights,’’’ in The Common Reader, first series. London: Hogarth Press, 1925.